Our first day back was good, aside from the mozzies. Lewai made a wall and finished up some benches in the “living room”. We put up our mozzie net and made a little refuge. 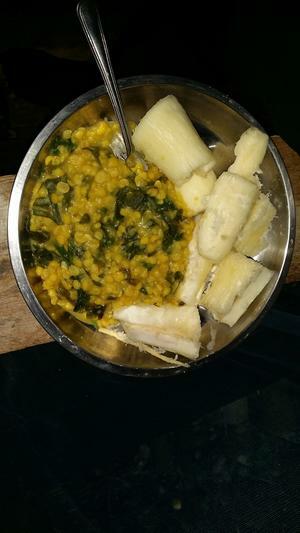 We made a big meal of cassava, daal (split peas), and bele on our rocket stove. I got word from the radio DJ and fantastic singer Neesy Smith that she was giving the track Mr. Sun on 3MDR radio in Melbourne's east hills! We slept great, the bed is very comfortable! We got up early and tried to save time and firewood by making food for the whole day at once to conserve the energy of maintaining the fire. Lewai loaned us a kerosine cooker (primus), but we need to cook on an efficient wood stove whenever the weather allows. Firewood takes time and effort, but it doesn't cost anything and ashes are a valuable resource that serves several purposes. We used the primus to quickly heat leftover cassava with sauted bele and fried egg. Mike gave his mom Terry and her “squeeze” Jim a bit of a virtual tour of our land as they are helping us to design our first structure. We walked the block again choosing spots for a path and various trees we want to plant. Then Lewai tried to teach us how to weave coconut fronds for the cover of our cooking space. He's really fast at making a tight weave and we must be slow learners so he did most off the repetitive work. I've been working on perfecting a few really difficult finger-style guitar tunes, to the point where I can focus on the vocals rather than having to concentrate so much on what my fingers are doing. We're back at camp (just dawned on me that we need a name for our camp) for the second night sitting on our soft bed inside our tent listening to all the critters, frogs hopping all over the place, an occasional branch or ivi nut or something falling somewhere out in the forest. It's actually quieter at night than in the daytime out here compared to other places we've been. Earlier Samantha said point blank, “What if Blair Witch started happening right now? And instead of frogs hopping and shuffling around out there on the detritis of the forest floor, it's people walking around?” We've been on camping trips with people who are absolutely terrified of the arid Arizona pine forest and won't even go off into the trees to pee after dark. Here we are on a little island in what was once arguably the most feared area in the world. You could have gotten eaten. Though the idea of being afraid of the locals is laughable, unless you watch far too many horror movies... and just about every guy here carries a machete..